The overall blocking “heat wave pattern” across Europe is changing this week, as a more progressive pattern develops. A large deepening trough is placed across the E Atlantic while an upper ridge remains over ENE and N Europe. In between, a corridor of strong warm/moisture advection brings unstable airmass ahead of the cold front and favorable conditions for development of severe storms. The first day of active storms will be today, Tuesday Aug 7th, across N France, Benelux and NW Germany. Strong instability and moderate wind shear overlap and an outbreak of severe storms is expected in the late afternoon, evening and night hours. A quite impressive moisture recovery takes place beneath an EML plume from SW Europe across France into Benelux region, so strong instability with locally above 2000 J/kg of MLCAPE builds up. Some models are simulating even up to 3000 J/kg which enhances the potential for explosive development of storms later this afternoon. 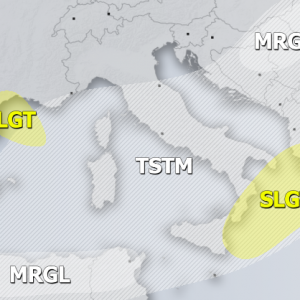 Below is a comparison of ARW, GFS and ARPEGE models. As the deep trough over E Atlantic pushes further east into western Europe, jet stream strengthens on its eastern flank due to a tightening pressure gradient against the upper ridge to the east. This will allow development of strong shear across the area discussed, overlapping well with strong instability – organized storms are expected. The best instability/shear overlap will at first be present over N France and then improves over Benelux overnight. Looking at the supercell composite index at 18 UTC (8 pm local time), it reveals an impressive amount of fuel for organized severe storms. 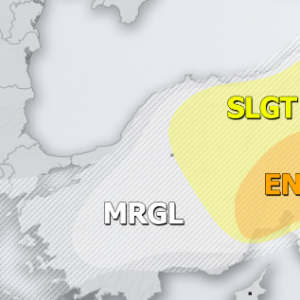 Taking in account the amount of energy and shear across N France, intense supercells and multicell storms with threat for very large hail, severe winds, torrential rainfall and even tornadoes are expected. The low-level wind field / shear increases as well, resulting in enhanced SR helicity in the evening hours. Taking a look at the simulated reflectivity for possible tracks of severe storms: the first map is for 18h UTC, next 21h UTC, 00h UTC and 03h UTC. Expect scattered to isolated severe storms in the beginning, that will tend to merge into larger clusters (MCS) with bowing segments (threat for severe damaging winds) in the evening hours. They will move across Benelux overnight and likely end up in NW Germany in the morning hours of Wednesday. 24-hour rainfall accumulation map: a swath of storm clusters developing in extreme N France is evident, moving across Benelux region into extreme NW Germany until tomorrow morning. Notice also scattered storms over central Europe and the Alpine region where strong instability is also present. There is, however, a lack of good shear which will lead into weakly organized or pulse storms / multicell clusters mainly in the afternoon and evening hours. Another point of interest today will be a quite strong warm advection with the instensifying mid level jet stream: 8-12 °C warmer than average afternoon temperatures (850 mb – 1500 m level and 2 m) should push peak values into 35-38 °C range from central France across Benelux and NW Germany today.